Incidentally, this entire menu came from the TV show "Mad Hungry" on Hallmark Channel. Of course, anything produced by Martha Stewart is going to be good, and these recipes didn't disappoint. My meal consisted of Shrimp Scampi, Caesar Salad with Homemade Croutons, garlic bread and Busy-Day Chocolate Cake. We were stuffed! 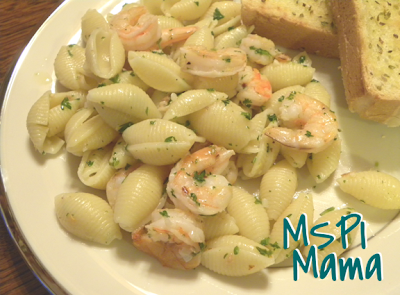 I made the Shrimp Scampi with pasta, like was shown on the show, but you can easily serve it over rice or just by itself with bread to sop up all the yummy sauce. Bring a large pot of water to a boil over high heat. Add the pasta and a generous pinch of salt and cook until al dente. Drain the pasta, reserving 1/2 cup of the pasta water. Meanwhile, heat a large saute pan over high heat. Add 1-1/2 tablespoons of the oil and swirl it to coat the pan. Add the shrimp in a single layer. Sprinkle with salt and pepper. After 2 minutes, turn the shrimp over; add the remaining 1 1/2 teaspoons of oil, the garlic, and the red pepper flakes. Stir constantly for 1 to 2 minutes, regulating the heat to avoid burning the garlic. Add the lemon zest and white wine to the shrimp. Stir to reduce the wine slightly. Add the lemon juice, cooked pasta, and reserved pasta water to the pan. Toss to combine. Remove from the heat and sprinkle with the parsley. Serve with a drizzle of olive oil and extra red pepper flakes on each serving. Tips: I know it's tempting, but do not use precooked shrimp. It won't turn out as well. And if you have any questions about how to prepare this dish, follow this link to watch Lucinda make it!